Infrastructure automation is simply the process of automating the infrastructure with the integration of various actions on a variety of devices, including the routers, servers, switches, storage, load balancers, laptops, and desktops. Infrastructure automation has a lot of critical manual steps has become an enterprise imperative. Infrastructure automation can replace the involved manual efforts, and drastically reduces the time taken for the deployment of several browsers. It also enhances the overall efficiency by reducing the snowflakes and configuration drift errors. 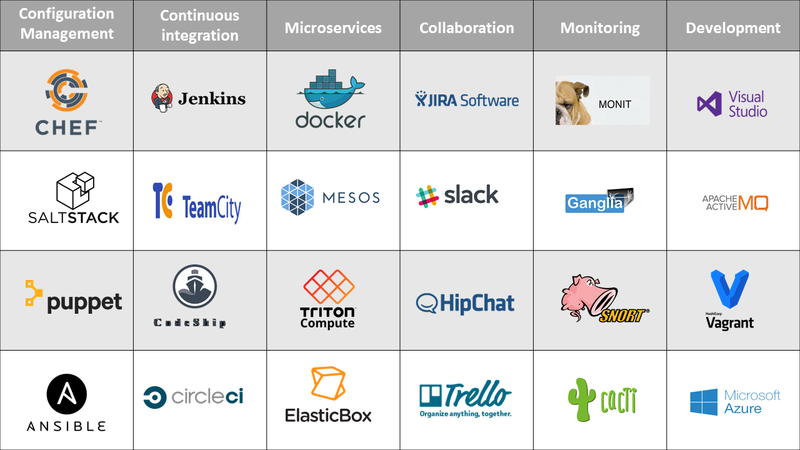 A variety of tools for infrastructure automation management are available today. But the real expertise lies in the selection of tools as per the requirement. No tool can fully satisfy all the needs like server provisioning, configuration management, automated builds, code deployments, and monitoring. There are so many factors to be considered while selecting the tool for infrastructure automation. Ansible can unbelievably automate continuous integration and continuous delivery of your system. Being a deployment and orchestration tool, it enables continuous delivery and continuous integration (with no downtime) which are some major unsolved IT challenges. Ansible ensures simple and user-friendly IT automation which can transform the tough tasks into repeatable playbooks. Network automation and centralized deployment can be performed efficiently with the universal language, Ansible. Ansible can breakdown the complexity of the tasks, deploy apps and manage systems. It can share the solutions of the solved problems with everyone to enhance the overall efficiency. You can easily obtain rapid productivity and all the tasks are executed in order. Ansible loves the repetition which the human resources hate. Ansible is the only available automation language which can be used throughout the IT teams, from the systems and network administrators to the developers and managers. All these features have made Ansible one of the most popular open-source communication tool. Once Ansible is installed and some hosts are added to the inventory file, you can try to connect to your hosts. By default, a connection is established with ssh keys, and you can also set up a username and password. The chef is yet another efficient infrastructure automation tool, which ensures an automatic configuration and deployment in a growing environment. Just clearly specify the required configurations in one centralized server then accordingly all the related nodes will be configured. Configuration Management helps in performing these tasks in an organized and easy manner. This is the basic function of Chef. You can also have a transparent historical record of system state which will be of great help during project management processes and auditing. The Chef can reduce or eliminate the duplicated efforts within the team and various interrelated environments to ensure a consistent configuration throughout the development life cycle. Due to the intelligent operational design, configurations are altered only when the system deviates from the desired state, and no action is taken on properly configured systems. The tool is highly customizable and enhances an easy migration and management. The Chef Development Kit (ChefDK) comprises extra efficient testing tools. They guarantee to automate the infrastructure validation before they are being applied to your environments. Various elements of the Chef are Chef workstation (users interact with the Chef), Chef client nodes (Machines managed by Chef), and Chef server (center for configuration data). The nodes are instantly updated with the configurations in the server. Puppet can extraordinarily define your infrastructure according to its desired state and automatically enforces configurations. It can also rectify any unexpected deviations to ensure your systems are in a good state. Better understand your system, what you have in the cloud, containers, the running software, etc. Puppet can ensure better customer satisfaction as it has a greater speed in maintenance and optimization of infrastructure and delivery of traditional applications. Complete visibility and transparency throughout thoroughly support the team collaboration as well as auditing. The Puppet, one of the most popular open source configuration management tools, is developed by keeping system administrators in mind. A puppet agent is run on all the all the servers to be configured. It extracts the compiled module and installs the specified software packages mentioned in the module. Puppet was first released in 2005, and the project has grown ever since. Google, Twitter, Sun, Sony, Red Hat, New York Stock Exchange, Digg, SlideShare, Shopzilla, and Harvard and Stanford universities are now all utilizing Puppet configuration management. Docker has gained a lot of popularity among DevOps practitioners and those who deal with Cloud computing. As it significantly enhances the portability of applications, it is highly accepted in organizations that use multi-cloud or hybrid environments. Docker works on the principle of process level virtualization. It creates “containers”, the isolated environment for applications. These containers can be smoothly transferred to any other servers without disturbing the application. Docker Containers safely package your code and dependencies together that the applications can run in any environment ranging from your local workstation to any server. The built configuration files are called the Dockerfiles. They serve as the solid foundation for developing the containers which include code, runtime, system tools, and libraries, and settings which are necessary to run a software. With Docker, Build on Linux Containers (LxC), application/infrastructure developers and IT operation teams can enjoy the complete freedom to create virtual environments. It also provides a platform for innovation and collaboration. Vagrant is an efficient tool to configure Virtual Machines for a development environment. The working is based on a configuration file called Vagrantfile, that consists of the complete set of configurations needed for a Virtual Machine (VM). Upon development, the VM is shared with other developers to create the same environment. It works well with other tools like chef and puppet. Vagrant is specialized for easy and rapid creation of development environments which use a small number of virtual machines. Automating infrastructure deployment and configurations can reduce a lot of manual effort and manual errors. Hence, it can rapidly increase productivity and reduce downtime. The only point to be taken care of is the selection of the right tool from a lot available in plenty for the desired results. Are you dealing with slow servers? Apachebooster, an advance cPanel plugin, is there for your rescue. Combined with Nginx and Varnish, it is a great and one of the most popular server boosting software plugin. Technology Ansible, chef vs puppet, devops basics for beginners, docker, tools for infrastructure automation, vagrant. permalink. How to monitor real-time internet bandwidth?